This past Sunday was Maine Open Farm Day. Participating farms throughout Maine literally open their (barn) doors to the public, with tours of their farms, products, and demonstrations of farming techniques. There are many different types of small farms in my area. There are small self-sustaining farms which do not sell what they grow to the public, and grow only enough for their own consumption. There are highly specialized farms, all within 10 miles or less of me: Pietree Orchard with hundreds of apple trees and blueberry bushes; Kezar River Farm, an alpaca farm which markets their wool; Twin Mountain Farm, a dairy goat farm; North Country Draft Horses, a farm that breeds and raises draft horses; Beech Hill Farm and Bison Ranch, a farm that breeds and raises bison for their meat and hides, and grows vegetables as well; and Deerwood Farm and Gardens, which raises vegetables, perennials and herbs. So many farms; so little time. 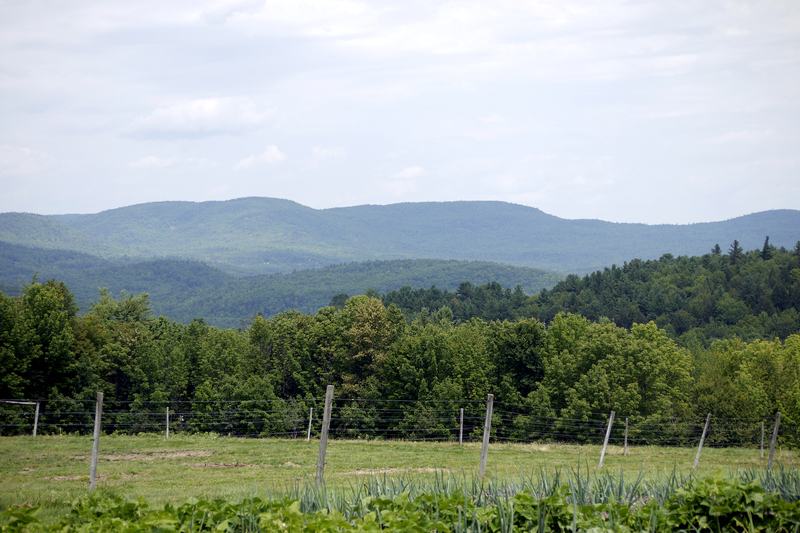 I decided to visit Beech Hill Farm and Bison Ranch, as well as Deerwood Farm and Gardens. I was not disappointed. Looking from the vegetable garden towards the pasture and beyond. 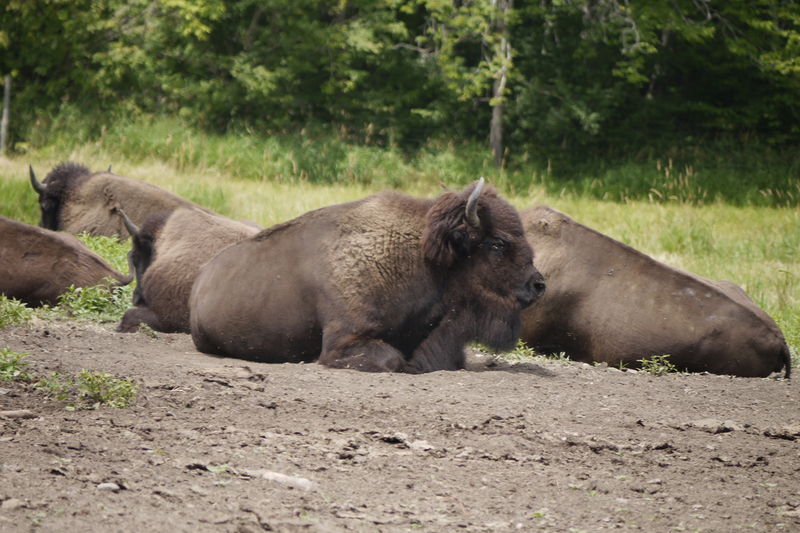 Currently they have 15 – 17 bison at any given time. Slaughter is usually in November, and they cull about 5 – 7 bison annually. They usually have 5 – 7 new calves each Spring but this year they had only 3. Their giant bull bison is getting up in years, and apparently his studly prowess ain’t what it used to be. He’s 17 now, and the typical lifespan is 15 – 20 years. The owner sells the meat to the public (he ships) as well as to gourmet restaurants. He also sells the buffalo hides for rugs, upholstery and wall decorations (these run +/- $1,500). I asked him if it would be possible to slaughter the bison according to kosher standards, but he was not interested since he has more than enough business as it is. I do buy his bison bones for my dog, though! Besides the bison, he has a very large vegetable patch as well as free-roam chickens, and he sells eggs and vegetables from his farmhouse. The day I was there he had some wonderful just-picked beet greens, garlic, tomatoes, cucumbers, and squash for sale. I remember several years ago, my husband and I ate bison meat fairly frequently. Then there was some sort of disagreement between the suppliers and the kashrus agencies, and the supply dried up. What a pity! 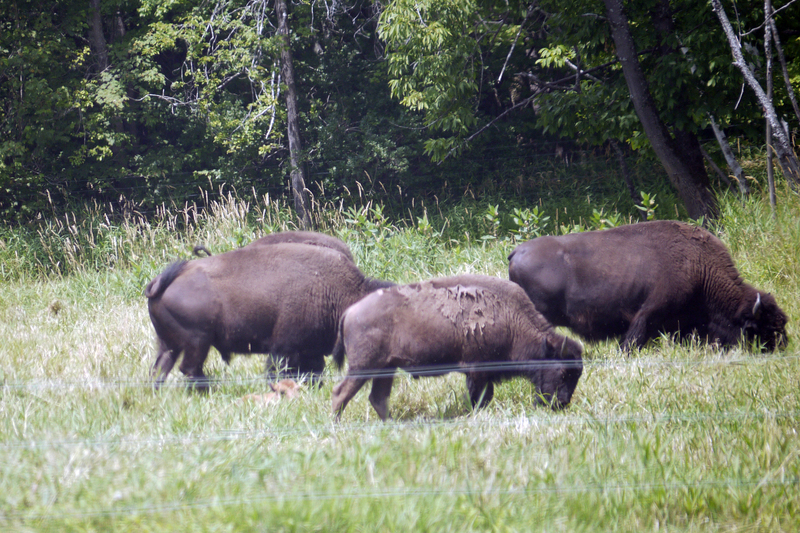 Bison meat is a free-range animal that isn’t plied with hormones or antibiotics. It’s lower in fat than beef and its cholesterol is less than chicken! The trick is knowing how to cook such a lean piece of meat so it doesn’t resemble shoe leather. The secret is to put a tablespoon of oil in a frying pan and sear the meat all around until the edges are brown. This technique locks in the flavor. Then you can season and prepare it however you would normally cook roast beef, albeit at a lower temperature. Bison is much easier to digest than beef, not to mention healthier. 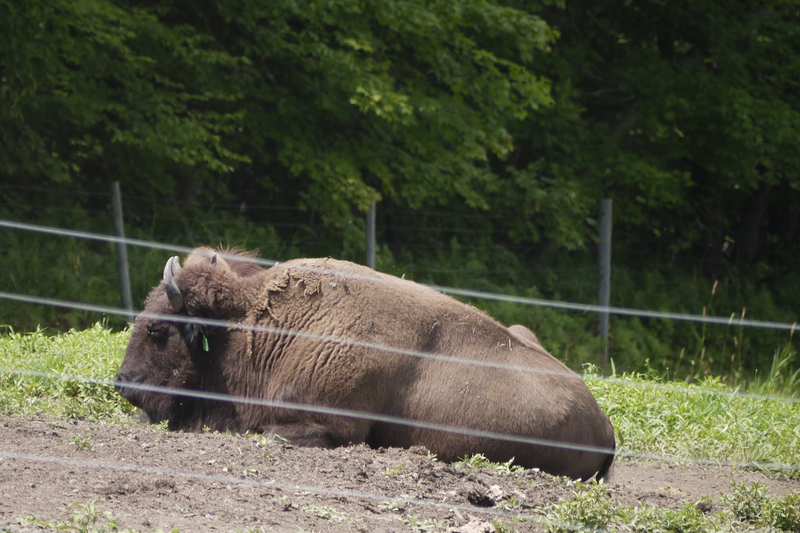 Too bad my local bison ranch is not kosher, but at least it’s a fun place to visit when the grandchildren come to Maine. Next I went to Deer Wood Farm and Gardens. 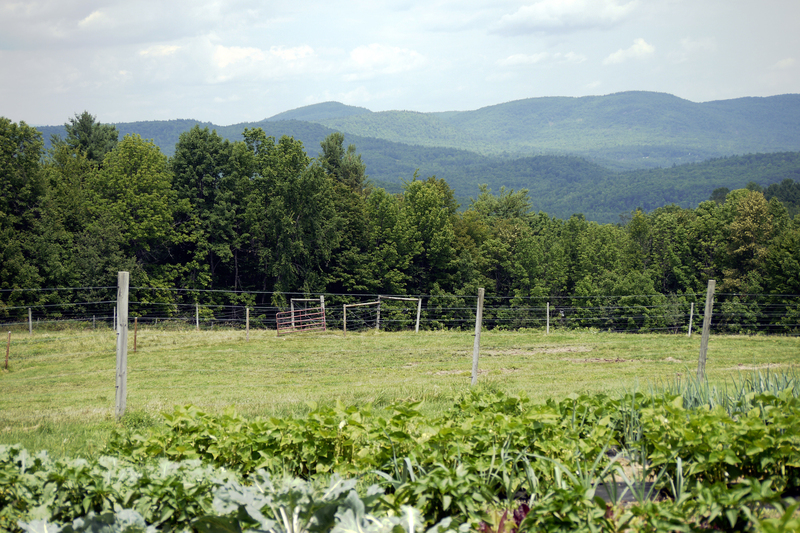 The owner’s vegetable gardens comprise many acres, and she hires apprentices who do a lot of hard labor for the privilege of learning farming techniques. Eventually many of them go on to start their own farms and nurseries. This is an all-organic farm, with no electric or machine tools used in cultivation. A lot of time is spent pulling weeds! The vegetables were huge: deeply colored red tomatoes, inky dark purple eggplant, rich maroon beets, and many shades and types of green lettuces. Although the owner does not have a cow, she does have poultry, and the eggs and free range chickens and fruits and vegetables that she grows are enough to ensure she’s self-sufficient. Her main income is derived from her perennial gardens. 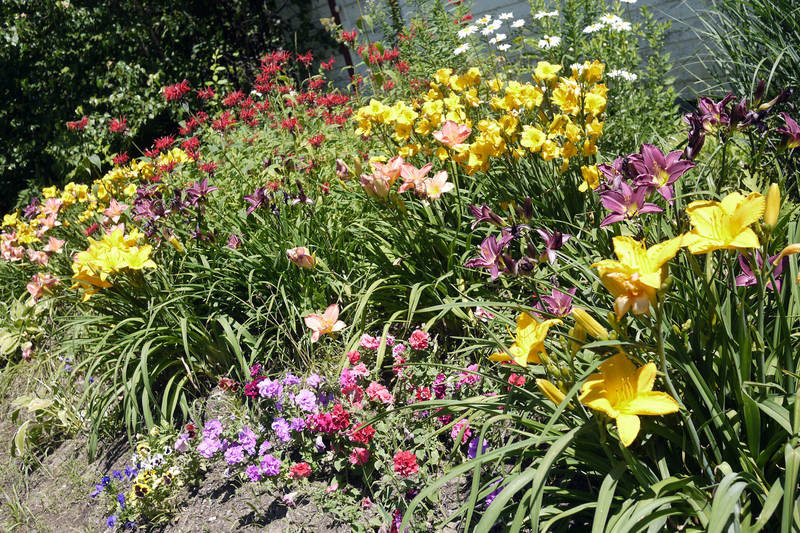 She has 200 types of daylilies which she sells to the public as well as nurseries across the country, as well as other shrubs, flowers and trees that are used in a part-time landscaping business. She also sells herbs – I bought some chocolate mint (a type of mint that has its green leaves tinged with brown, and really does smell like a combination of chocolate and mint), and the largest, tallest oregano plant I’ve ever seen. All of this inspired me with the big idea to further develop my property (husband is rolling his eyes about now). Self-sustaining gardening is really a full-time job and though it’s good exercise, it is extremely hard physical labor and more than I can realistically handle (which, my husband knows, means that he will get stuck with work he doesn’t want to do). Additionally, I’m usually back in my hometown during the months of May and June, which are the most important growing months in Maine. I can’t maintain a garden if I won’t be there to work it. Without use of an excavator or heavy-duty rototiller ($$$), I simply cannot prepare the ground sufficiently and remove all the rocks, roots and other impediments to create smooth, rich soil good for tilling. 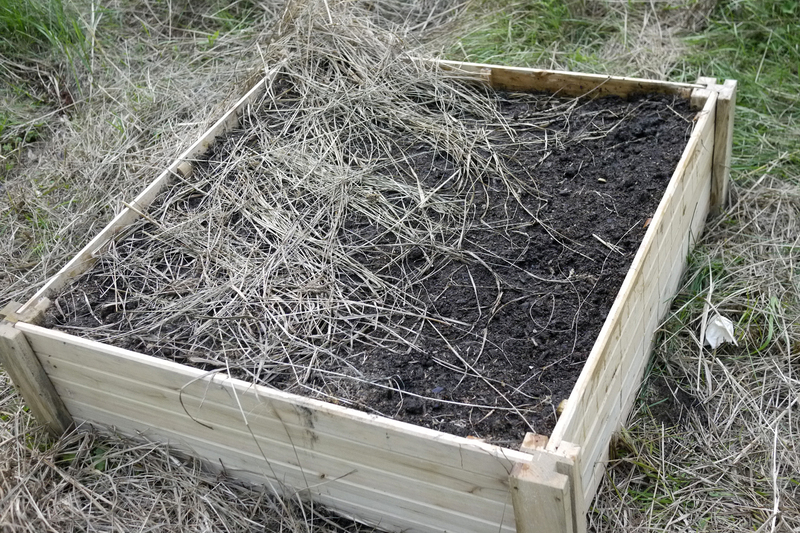 So I cheated: as an experiment I bought a 3′ square planter bed (a 4-sided wood box that is 1′ high) for $30 and filled it with MooDoo. After some research, I found out that there are a few plants that can be planted later than springtime: kale and spinach in July and garlic in the Fall. So today I ordered my garlic (it’s coming by mail after Sukkos, in October, from the Fedco seed company here in Maine); and I filled the planter bed with five rows of kale seeds. I covered the bed with dead grass which will act as mulch and hopefully prevent a lot of weeds from growing in between the kale. The dead piled grass will also keep the soil moist and prevent it from drying out. I especially appreciated HaShem making a rainstorm a few minutes after I was done, so that I didn’t even have to irrigate (my hose isn’t long enough, so I end up having to haul multiple 5-gallon buckets of water which weigh 41+ lbs per load). I am going to buy some more of these planter beds the next time I venture into town. I’ve placed the windows on my planter box . 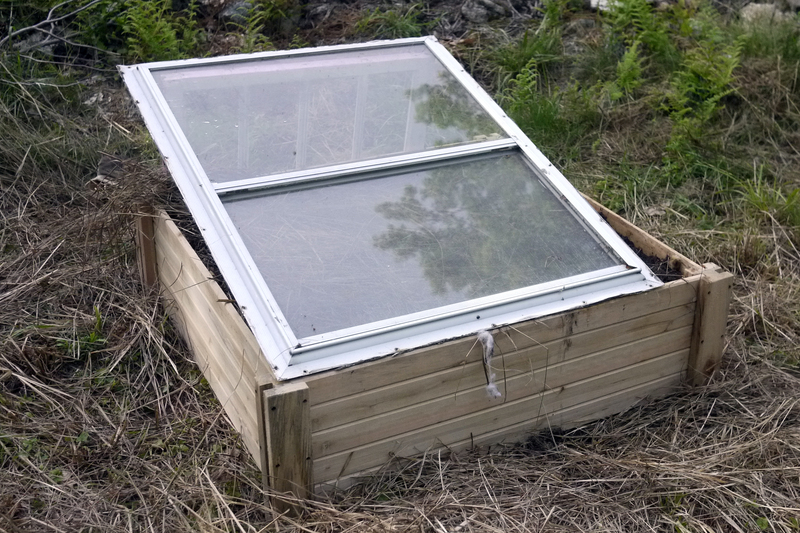 . . the cold frame will look something like this. Today I went for a long walk with my dog(s). (We are fostering another dog that is up for adoption, but more on that in a future post). About a mile from my house I turned left onto Hut Rd, which follows a lovely stream with vernal pools – – great natural swimming holes. (A few years back, when we were building our house but didn’t have water yet, we used to go there to soak and freshen up). About a hundred feet into Hut Rd., I was noticing a lot of wild blueberry bushes without blueberries. I thought to myself, “Hmmm, the bears must have eaten them already.” No sooner had that thought crossed my mind, when about 25′ away I saw a small moving black blob in the shade, in some tall grass. At first I thought it was my poodle, Spencer, as he and the other dog had run ahead. But no, there was Spencer – – nowhere near the black furry blob. And the other dog has a red coat, so it couldn’t be him. That’s when the light bulb went off in my head: Bear! Sure enough, it was eating berries. It was small – – the cub couldn’t have been more than six months old. It was about as wide as a dishwasher and half the height. It looked like a furry, cuddly, roly-poly black marshmallow. I would have loved to sit quietly and observe it, but the mother bear was nowhere that I could see. That meant that the mother bear could theoretically be behind me, and the last thing one wants to do is get between a mother bear and her cub. So instead of quietly watching the bear cub, I made lots of noise. The cub sat up, looked at me, and scampered away. I didn’t have my camera with me, but it wouldn’t have done any good anyhow, since the bear was in deep shade and high grass. I never did see the mother bear, but undoubtedly she was somewhere close by. The dogs had been oblivious to this little drama, far more interested in taking drinks from the stream and chasing squirrels. The rest of the walk was uneventful, and eventually we made our way home on this clear, warm summer day. American colonists had a tough time of it 200+ years ago, trying to farm in most of New England. Besides the extreme winters, short summers and even shorter growing window, they had to contend with thin, rocky soil, once they were able to clear the land after harvesting impressive timber yields. When I dug the holes for my apple saplings and blueberry bushes, I couldn’t make the rows even or straight due to numerous boulders and rocks and thick dead roots buried deep under the earth. I could have done some earth moving if I had a tractor (you see plenty of women on tractors in Maine), but right now it’s not in our budget (a good used one runs $12K – $20K). So we will live with asymmetrical rows. Year Two of my orchard. Apple trees grow slowly so it will be awhile before these bear fruit. You can see the bee hives in the distance. These newly planted highbush blueberry bushes look completely unexciting at present, but just wait a few years! I’ve been told it is very difficult to grow apples organically, because apple trees are magnets for insects and disease and do best when repeatedly sprayed with pesticide. For now, however, they remain untreated, since it will be several years in any case until they bear fruit. Blueberries aren’t bothered by pests (unless you count bears, moose and deer). After some research I’ve learned that the healthier and richer the soil, the stronger my trees will grow and they will then be more likely to survive, and reject infestation. The best way to enrich the soil is through composting. 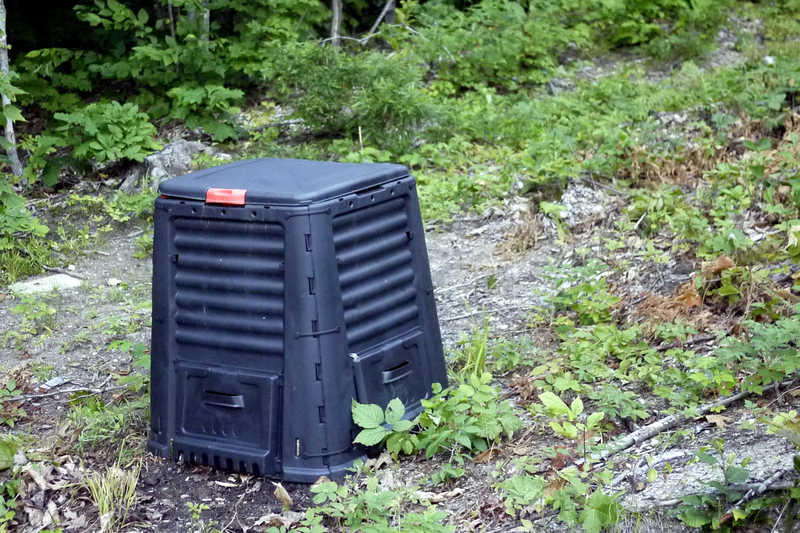 Our compost bin (made in Israel by Keter Plastics; we bought it at Lowes). 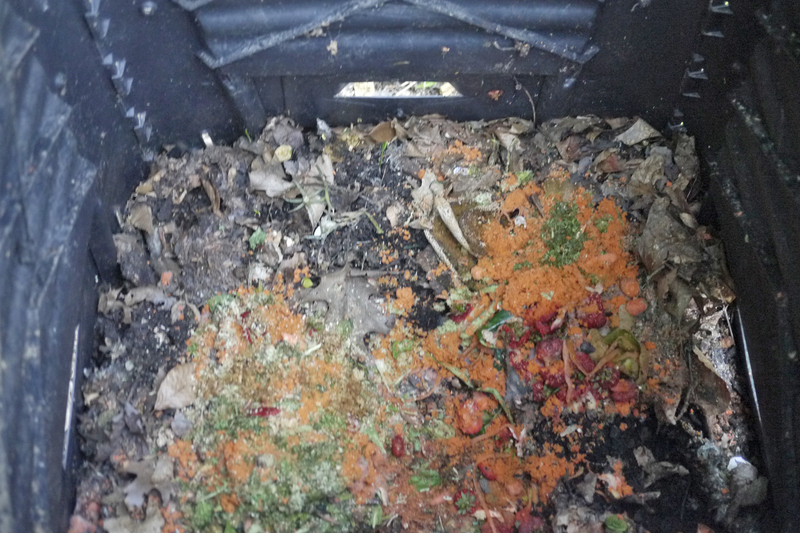 Here is what the inside of the compost bin looks like. The dark stuff on the bottom layer is already-composted fruit and vegetable peels that have turned into a rich soil; the top holds carrot, celery, apple, and other peels that I dumped the day before. It takes a minimum of 2 months for this to turn into compost. Fortunately, it’s nearly odorless. “Oh, you want Moo Doo!” said the sales associate at Paris Farmer’s Union. “Uh . . . okay . . cow manure . . I get it. But how bad is the stink?” I asked, not looking forward to transporting it in my car, much less spreading it around my property. I found this hard to believe and just hoped the four 25-lb bags were hermetically sealed without any holes. “Moo Doo!” the sales associate announced over the public address system. “I need four bags of Moo Doo for a customer! Mooooo! Doooo!” She actually mooed like a cow over the PA and smiled at me. I made the 35 minute trip home uneventfully, and more importantly – – since the bags were fortunately sealed tight – – odorlessly. Fortunately , when I opened the bag the Moo Doo was indeed odorless, and it looked almost identical to my all-vegetable compost. Intrigued, I went to www.moodoo.com. It turns out that the company’s dairy farm has a lot of cows which produce a lot of milk. Unfortunately, they also produce a lot of . . . shall we say, “end product?” In fact, manure runoff can pollute streams and ponds and the abundance of “riches” can be downright problematic when it comes to disposal. 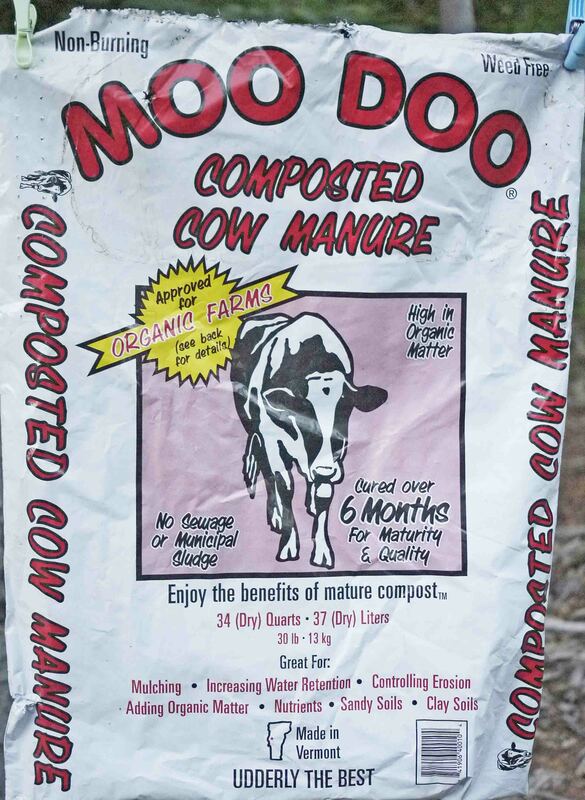 So the Moo Doo people came up with an innovative solution: compost it. They capture the methane gas that is produced, and then separate the liquid from the solid waste. Solids are brought to the composting facility, where they are incorporated with carbon sources to produce Moo Doo garden products. Composting uses aerobic bacteria, fungi, and other microbes to break down the complex organic matter into a stable substance known as humus (no, not that kind of hummous!). Amazingly, the methane gas extracted from the manure is used as a clean-burning, environmentally safe source of fuel for electric generation. This electricity is used to provide power to the farm, and any excess is sold to a local utility. I guess you could say it’s recycling from the inside out. So now I, too, doo moo. Or Moo Doo. Whatever! Udderly the Best . . .
You’ve probably seen Wyman’s brand frozen blueberries at your supermarket (they originate in Maine), or frozen wild or boreal blueberries at Trader Joe’s. These blueberries are much, much smaller than the typical fresh blueberries found in the produce section. While there are many varieties of blueberries, there are only two types of blueberry plants: lowbush and highbush. Highbush blueberries are the ones that are sold fresh. These bushes are 3′ – 5′ high, and they are the type you get at pick-your-own farms. They are quite easy to harvest and the blueberries are about the size of the head of a thumbtack. Lowbush blueberries, however, are a different story. They are native to Maine, New Hampshire, and Canada, and are very hardy, surviving winters of -40 degrees F. As their name hints, they grow very low to the ground, looking almost like groundcover rather than a bush, and rarely exceed 1′ high. Because the berries are so tiny – maybe 1/4″ in diameter – – and they are so low to the ground, they are very difficult to pick – – commercial harvesters use special rakes to save on constant stooping and bending and wiping out their backs. Lowbush blueberries are found just about everywhere here in the White Mountains (including on our property). Bears not only love them, they depend on them as part of their summer diet. Where there are blueberries, there are bears. 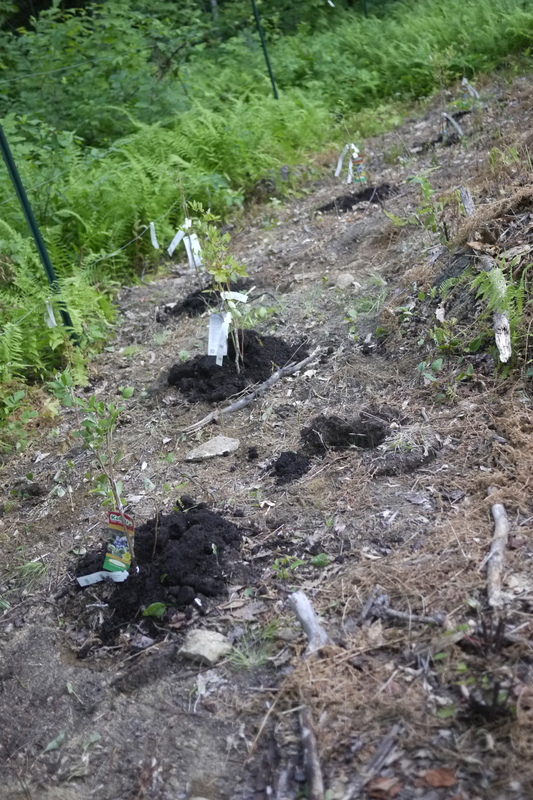 That said, I thought it would be nice to have some highbush blueberries planted near our apple orchard and apiary (bee hives), since the only crops easily grown in Maine are apples, potatoes, and blueberries. The bees will pollinate the blueberry flowers when they blossom next Spring. Today as I drove by Paris Farmer’s Union (an agricultural version of a hardware store), I noticed a sign announcing a 40% off sale on trees and shrubs. Fortunately that included highbush blueberries. Why the great deal? Well, the optimal time for planting is late Spring. Planting in the middle of summer, when it’s so terribly hot, stresses the plant, and they may not survive. They need much more watering than usual, and the soil has to be very rich. While my soil here is thin and rocky, and not the most amenable to farming on its own, for the past 2 years I have been diligently adding to our compost pile, and now the tossed peels and pits of fruits, vegetables, coffee grinds, eggshells and fallen leaves have decomposed sufficiently to make a rich, dark loam. The reason I started composting was not with agriculture in mind, it was of a more practical nature: there is no trash pickup where I live and the town dump is 9 miles away, so I do anything and everything I can to cut down on the amount of trash we create and garbage bags we have to shlep. There are no sewers here, either; we have a septic tank so we cannot have a garbage disposal. Hence, we dispose of all vegetative matter by composting. In the next week I will be doing some clearing near the orchard/apiary and digging several holes for the blueberry bushes. I’ll be trenching nearby so that a seasonal stream can irrigate the new plants. It may not look like much right now, but some day this place will (G-d willing) really be something! note: you can also find bargain-priced plants and trees at Home Depot and Lowes this time of year on clearance. A few years ago in my home town, I picked up several $40 – $60 trees for less than $10; and one absolutely dead-looking Butterfly Bush they gave me for free and it’s now a flourishing plant. Here I am, dressed so the bugs won’t get me. My husband did about 70% of the work, but I also helped with cutting, weed-whacking, raking and pulling! As the entire East Coast sizzled from the heat wave, it was warm here (79 F) but only mildly humid – – in fact, a beautiful day. As much as I dreaded it, I couldn’t put off brush-clearing any longer. The heavy May-June rains meant the wild grasses, weeds and brush, poison ivy and thorny raspberry bushes were in some places nose-high, and I was afraid that my apple trees would choke. Weeds also covered some of our solar panels, which meant we weren’t getting the maximum amount of light possible to energize the batteries that run the house’s electricity. The black flies, mosquitoes, and deer flies are still with us, however, so despite the warm temperature it meant ensuring my entire body was covered lest I get bitten to pieces. Besides ankle boots, long sleeves, gloves and a bug net for my head, I wore my husband’s jeans so the bugs couldn’t bite through the heavy denim fabric and my legs would be totally protected. (Even with all that, I did find a tick embedded above my ankle afterwards). I was completely mortified to find that my husband’s jeans fit me perfectly. Time to start dieting (again). Sigh. Last day of the season strawberries from Schartner Farm, No. Conway, NH. 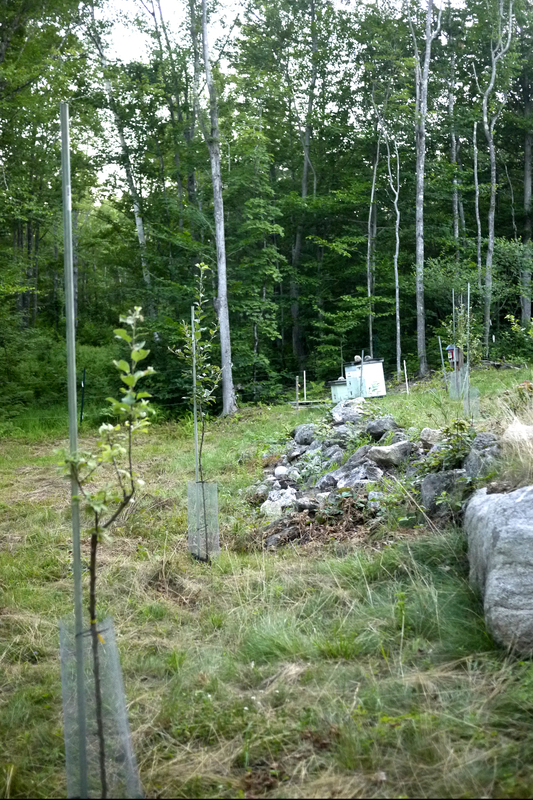 Two winters ago I attended a University of New Hampshire-Extension course on how to plant and tend an apple orchard. The agronomist giving the lecture happened to get sidetracked and started talking about strawberries. 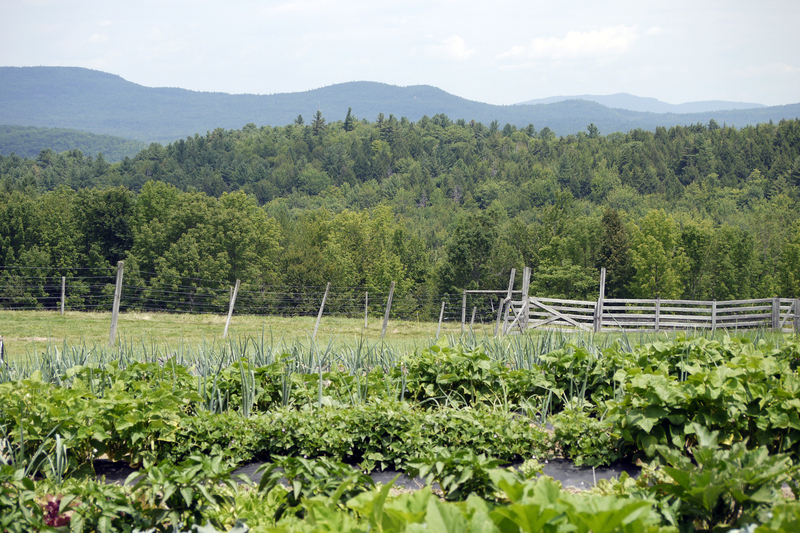 “There’s nothing like a New Hampshire strawberry fresh-picked from the field!” he declared. “Especially when you buy that tasteless thing they call a “strawberry” from California at the supermarket,” he added with disdain. I don’t know why, but his comment stuck with me. I just had to get my hands on a New Hampshire strawberry, but the season was short and the timing was never right – – until this year. It turns out that just over the border is one of New Hampshire’s largest strawberry farms, and due to heavy rains in June, the strawberries, according to our local newspaper, were bigger than usual. Picking started on June 18, but I couldn’t make it there until July 6, which, as it turns out, was the very last day of this year’s harvest. The best berries had already been picked, and what few remained were small and somewhat overripe. 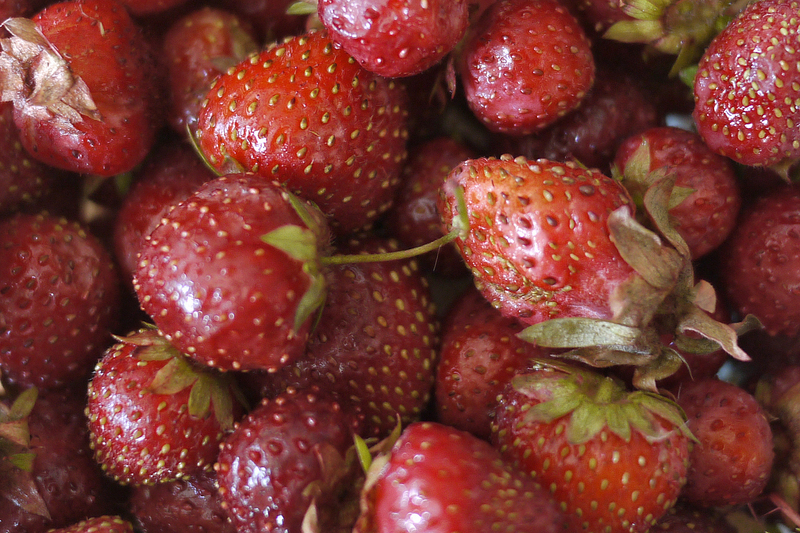 But the air was filled with the sweet smell of strawberries, which made the quest irresistible. 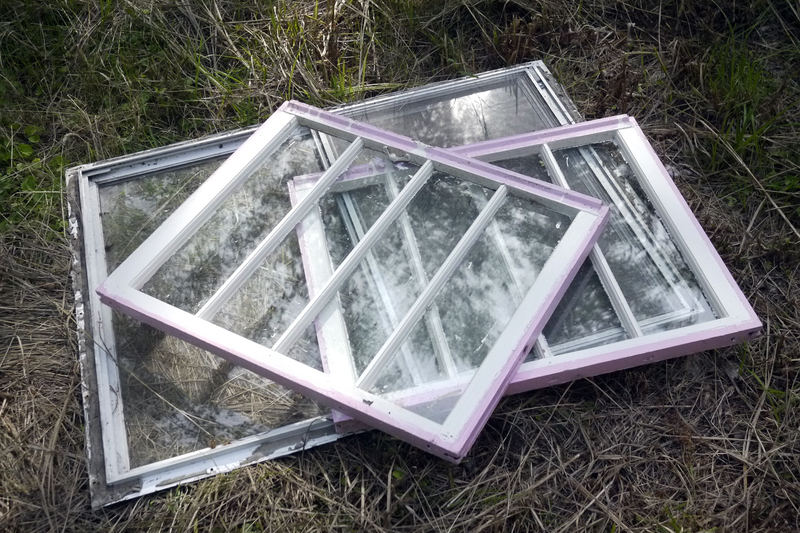 True, they weren’t as pretty as the large California-grown berries. They were almost completely round in shape, and the biggest one was no larger than a nickel. But they were so sweet – – juicy, dripping-off-your-chin sweet! They tasted as sweet as high quality strawberry preserves, but without added sugar. Now I understand why the agronomist waxed poetic about New Hampshire strawberries. I hope to be back in the fields next year, but hopefully I’ll catch the harvest a little earlier in the season. 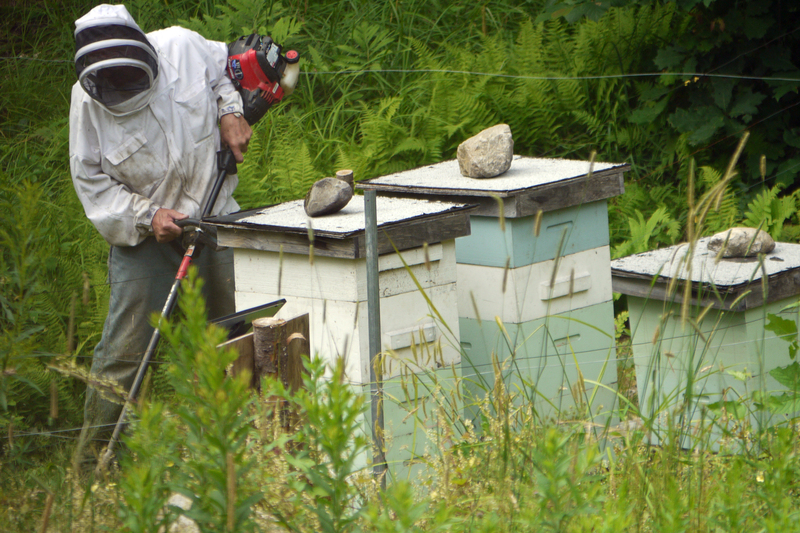 The Bee Man was back today to check on the hives’ progress. Ever so carefully he lifted off the large rock that weighted the top of the box to keep it closed. The entrance hole is at the bottom of the hive, and the bees create the honeycombs starting from the bottom and working their way to the top. 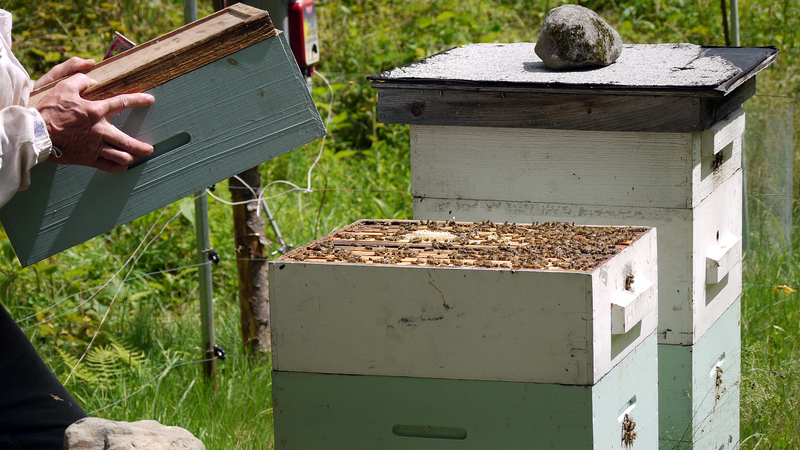 By checking on the numbers of bees on the topmost box, he was able to determine if there were enough bees to warrant adding yet another box on top of that one. Shlepping more boxes from his truck to the hives. These contain more trays for the bees to make combs and honey. If the honey becomes too copious inside, then the queen becomes “blocked” from all the honey and the hive will cease producing, so BeeMan adds another “floor” to their apartment dwelling. 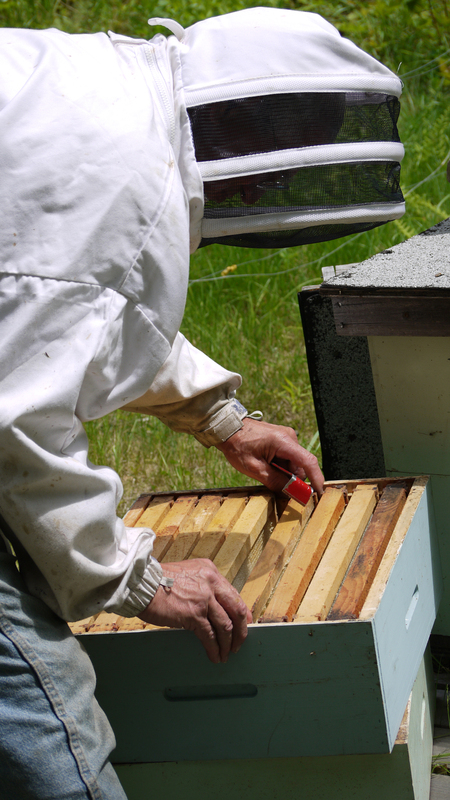 Before loading the new layer onto the hive, the BeeMan checks the spacing of the trays within. The bees will create combs on the trays, which will be filled with honey. A box like this can weigh 50 lobs when full of honey. 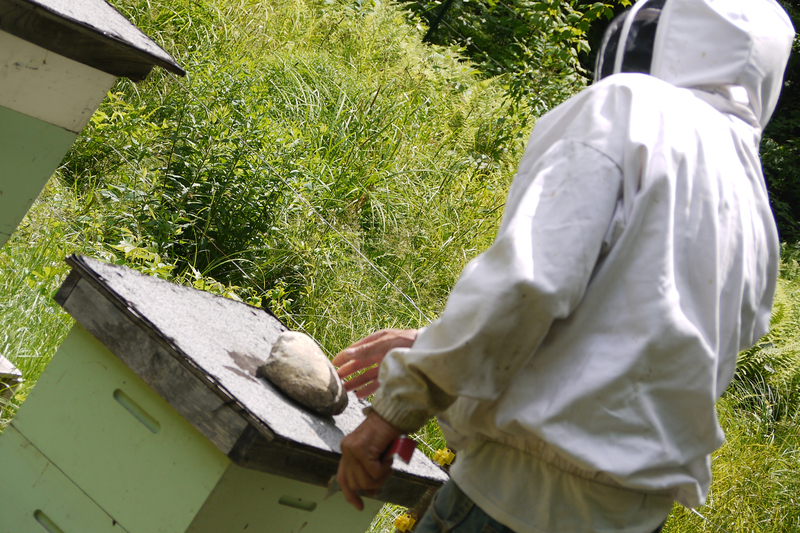 Being a beekeeper involves a lot of heavy lifting and is very hard on one’s back. The BeeMan is well into his 70s, and he’s in impressive shape! This is what one of the trays look like from the box. It’s lined in plasticine, and the bees make a honeycomb over the surface, which they fill with honey. 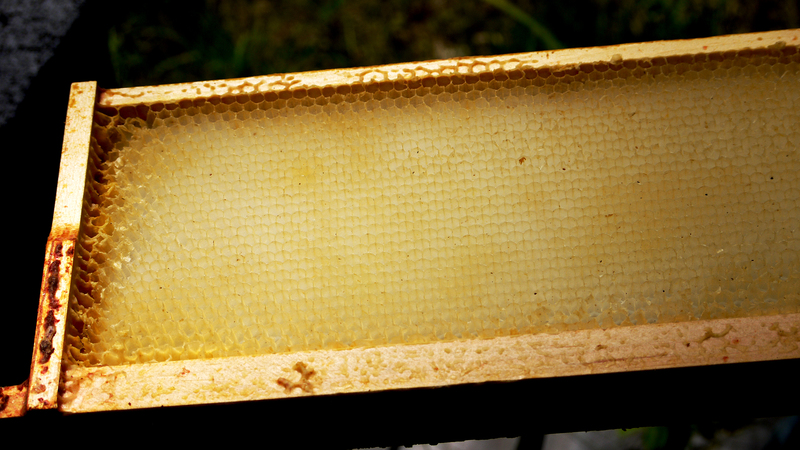 This picture shows the honeycomb, but the honey has been extracted, spun, and filtered. 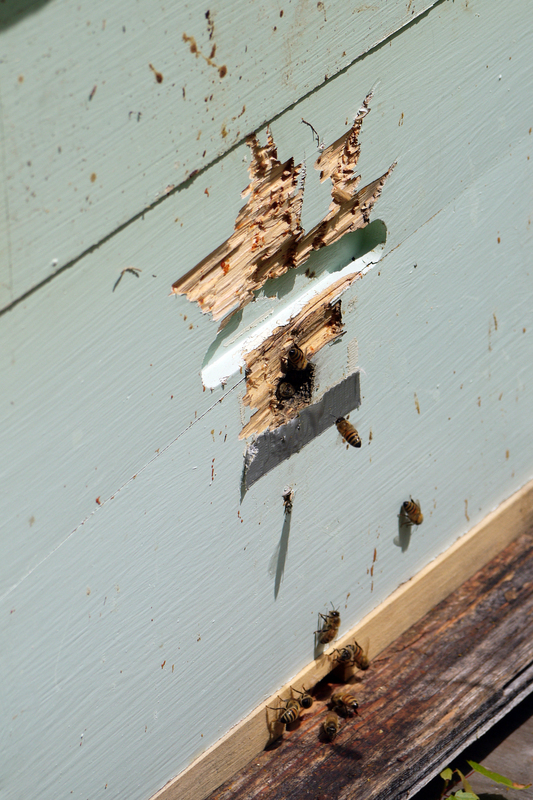 The bees seemed to be doing well, which was surprising, Bee Man said, because this year honey production will be down by 50% due to the over-abundant rainfall in the month of June. 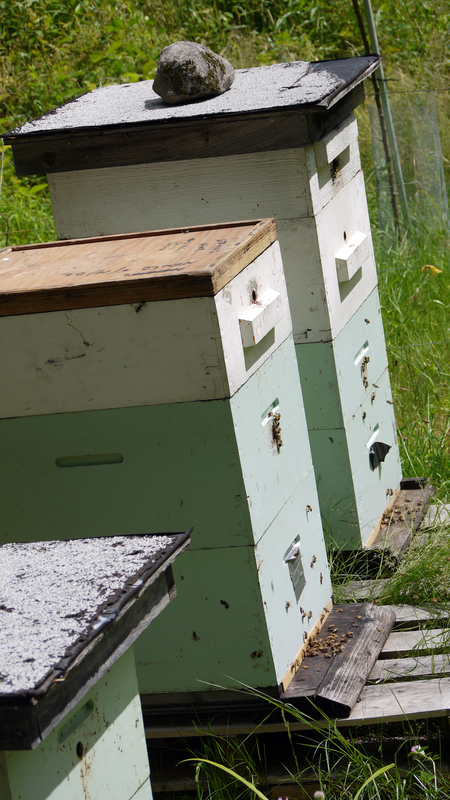 He’s thinking of adding two more hives next year if they continue to thrive and they survive the winter. Bee Man said that this year bears have been a problem, and he seemed relieved that so far the local bruins in my immediate area had (so far) left his hives alone. Afterwards Bee Man did some weed-whacking around the hives. While weed-whacking he wears a “bee jacket” which has a protective face guard. Much to my disappointment, my grandchildren are scheduled to visit the week after he’s done, so they will miss the honey harvest entirely – – a lost educational opportunity I was really hoping they’d get to experience. I asked if I could go to his house and watch him extract the honey from the combs, filter it and bottle it. It should be really interesting. But one thing I’ve learned already: I’m glad I didn’t attempt beekeeping on my own. 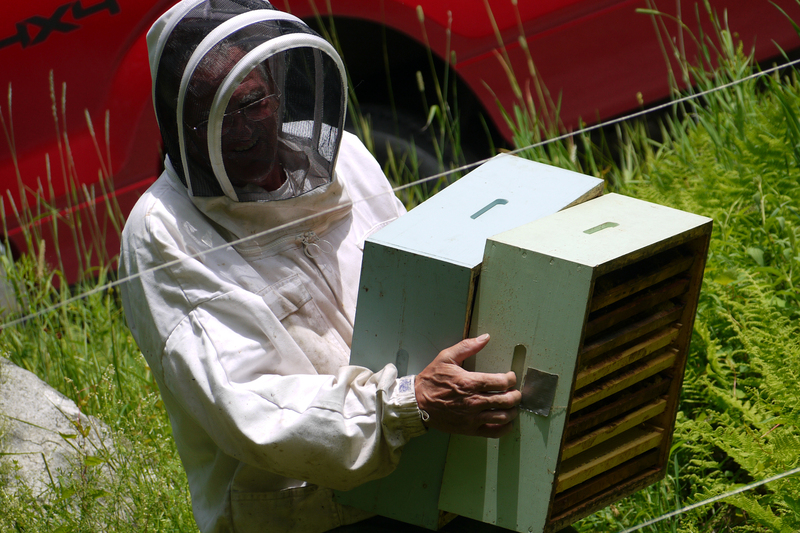 Beekeeping is both a science and an art. There is a huge amount to learn, and a huge amount of things that can go wrong, and it’s quite expensive to get started. For me, having a “bee yard” on our property but managed and funded by someone else has been the best of all worlds, even if it means I’ll only get a jar or two of honey at the end of the day.